White dude publishing as Yi-Fen Chou in @BestAmPo—this is not what we meant when we asked for more diversity in publishing. But I realized that I would primarily be jettisoning the poem because of my own sense of embarrassment. I would have pulled it because I didn’t want to hear people say, “Oh, look at the big Indian writer conned by the white guy.” I would have dumped the poem because of my vanity. … I had to keep that pseudonymous poem in the anthology because it would have been dishonest to do otherwise. 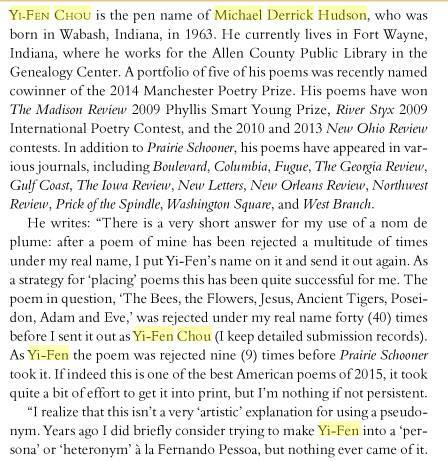 If I’d pulled the poem then I would have been denying that I gave the poem special attention because of the poet’s Chinese pseudonym. … And, yes, in keeping the poem, I am quite aware that I am also committing an injustice against poets of color, and against Chinese and Asian poets in particular. But I believe I would have committed a larger injustice by dumping the poem. I think I would have cast doubt on every poem I have chosen for BAP. It would have implied that I chose poems based only on identity. With all respect to Alexie, whose writing I love, and whose predicament I don’t envy, I think the values he ascribed to his options are naïve and limited. Anthologising is an unforgivingly subjective task that involves multiple considerations. But by deciding that the deception was relevant predominantly to him, as editor, and Hudson, as writer, he narrowed the focus of his decision to the detriment of the general discourse about racial identity. I don’t agree that it would have been dishonest for Alexie not to include the poem – but I definitely think it was dishonest for Hudson to change his name for the purposes of submission. Since he thought he was being so hard done by editors’ interest in writing by non-white people, he should probably also have magically bestowed, retroactively, all the privileges of his white life upon his competitors, or taken on the systemic burdens writers of colour have sustained throughout their lives and careers. In the absence of any such miraculous field-levelling, his experiment ends up looking ugly and callous and completely self-interested. Alexie assumed that there were only two courses of action: include the poem, or don’t include the poem. I disagree, and for my part, I think he should have pulled it. If it truly was a Yes/No question and, as Alexie wrote, he had set ethical guidelines about whether to include close friends in his selection (no) or about being swayed by a poet’s reputation (no again), then surely a poet trying to get attention speciously through misidentifying one’s race could merit a new rule. But in my opinion, this wasn’t actually a Yes/No decision. It was a ‘Yes, because … and … although’ or a ‘No, because … and … though’ decision, and that is not just a binary set: No, Hudson’s poem shouldn’t have been included, in spite of Alexie’s embarrassment or any sweeping generalisation about his methods that might be made, because its author’s fraud makes a mockery of the real struggle that writers of colour face. I understand Alexie’s pain about the problem. Hudson’s poem has some vibrancy (you can read it here). But it’s not so good that it should have trumped the opportunity to discourage convenient racial appropriation. 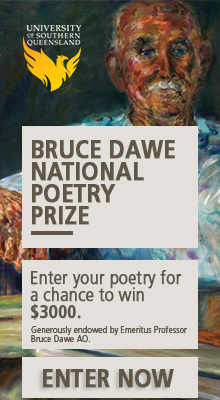 I wonder – and don’t wish to find out – whether any poem would be. Far from being primarily a reflection on Alexie as editor, the true identity of ‘Yi-Fen Chou’ has had real effects for writers of colour as well. It may have complicated, no matter how subtly, the submissions process for Asian poets for the time being. Certainly at present, it’s overshadowing the contributions of the other selected poems. More broadly, it has angered many writers of colour, who are rightfully perturbed by the perversity of Hudson’s triumph – and in many cases exhausted from fighting various literary battles of their own. Of course, the questioning and disgust should really be aimed at Hudson himself. As of this writing, Hudson hasn’t responded to journalists’ requests for comment, but I doubt anything could be more telling than the story of privilege his biography tells. And perhaps he’s said enough, anyway; to quote from his lauded poem: ‘My life’s spent / running an inept tour for my own sad swindle of a vacation’. Incorrect – nowhere in the bio does it mention he is white. Is this picture enough for you? It was the first link after searching “Michael Derrick Hudson”. It really makes a person take stock at the level of victimhood we subject ourselves to (everyone, that is, left, right and everyone between). And yet isn’t the system to blame? These outrages point more toward homogenity than diversity. Break down the boxes altogether and let everyone have some dignity.